Over the last couple of days, I had fun trying out gracekelly's double Gavroche trick, and playing with various combinations. My favorite so far, is a black/blue and cassis/orange Ex-Libris, tied in a Twist knot. To honor a few requests for a detailed how-to, here a photo step-by-step. Fold each Gavroche in the basic bias fold, and then tie them together at one end with a Petite scarf ring, or a small double knot. Place the resulting long stripe on your neck, with the ends hanging down your front. From there, you can try a variety of knots, with or without scarf rings. For a necklace type of look, proceed with the Twist knot. Today it's cold and grey outside, and it has not stopped raining all day. We are having friends over for a casual Sunday lunch, and will spend the rest of the afternoon by the cosy fire. Wearing my Gavroche Twist knot and a soft and big cardie. Have a wonderful rest of the weekend everyone! Here a pic from some time ago, trying the same principle with two 70 Carrés, only bringing the ends back to the front and then securing them with a double knot. I love this look MT! Makes me want to rush out and buy more scarves lol!! Thank you for the tutorial. I was curious how to do this. 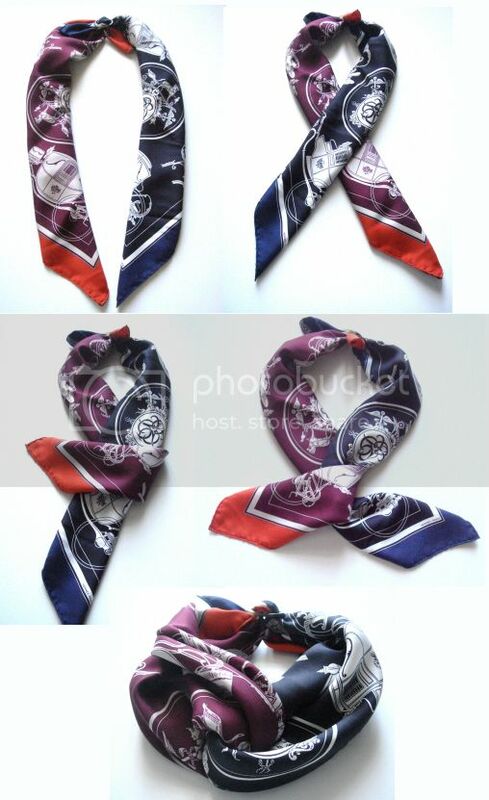 It's a fantastic way to combine scarves and try something new! I don't even see the scarf - you look so utterly beuatiful there! Kudos to Gracekelly, and the many new possibilities offered by combining the two Gavroches. What I like the most is that it creates a very original and unique look. I love your take on the idea, and cannot wait to experiment with 90s carrés. Beautiful soft piture, and a happy déjeuner du dimanche au coin du feu. Thanks for the how to - seeing as 90cm are becoming ever more expensive this is a good way to buy more gavroches and also have less bulk around ones neck. Love it! 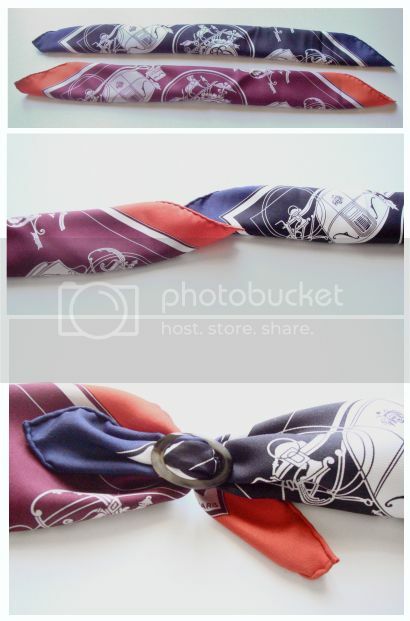 Your two 70cm scarves are beautiful and tied together even more! Here it has been raining all day long as well. To spend the Sunday afternoon in front of the fireplace seems to be the right choice! Wishing you, dearest Maitai, a lovely week ahead. 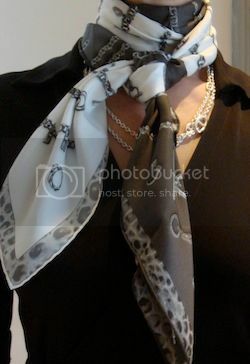 Hugs, M.
Dearest MaiTai, What a perfect marriage of scarves - totally love how you tied both designs. The EL Gavroches look so wonderfully fluffy, all nestled inside your warm and cuddly sweater. 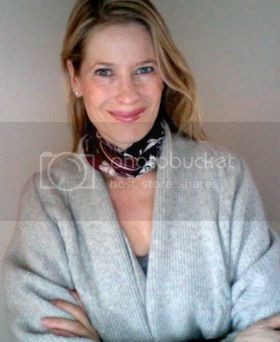 And so glad you brought back the CeG picture - an amazing combination with masterful double scarf tying. Everything you touch becomes beautiful and warm. You are truly a rare gift, my dear friend. Thanks to both of you for the idea. And the questions of a dummy - how do you secure the dangling ends in the necklace type of the 2-gavroche knot which you have demonstrated? Is it just another simple knot? LOL, dear JA_UK, me too! Bonjour, ma chère Jamais! Hope you are having a good time playing with your 90 Carrés, I will have to try that too! Nothing beats the coin du feu on a cold and wet Sunday, stayed there right until bedtime..
You are very welcome, dear Scarf Addict, and good point re the bulk, so true for the 70 combo as well. Less bulk, plus extra cash for more silk, yay! Not at all, dear Anna. After crossing both ends, bring them back behind your neck. Then, you could either make a small double knot, or feed them through the scarf ring. Hope this helps, good luck! Thank you, dearest MaiTai. I wish I could!...I would do it with great pleasure. Hugs, M.
Hugs to you to, my dear Manuela. Have a great weekend!